Who doesn’t love scallops? We do, obviously. This is a simple recipe with gourmet, elegant results that’s sure to impress any dining companion. 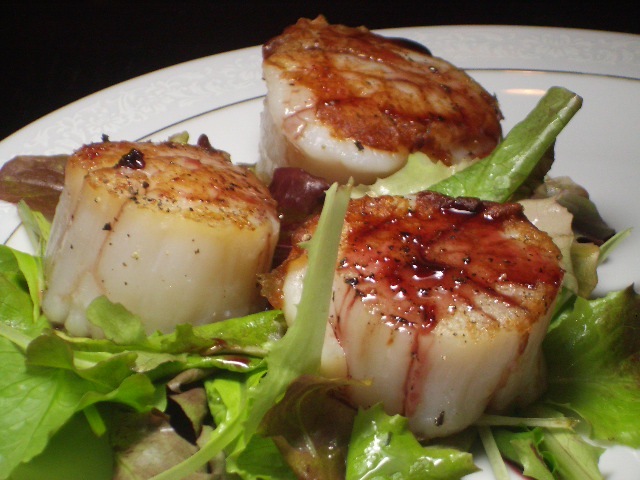 By the way, served over mesclun greens, these scallops are even better. The pomegranate sauce turns out to be a marvelous dressing for the greens and brings it all together. It’s even better when your mesclun greens are grown right in your neighborhood by good friends. Thanks Melissa and Matt! If your scallops came from Trader Joe’s (as ours did), slowly thaw the scallops. If they’re part-frozen when you start to cook them, it’s not going to go well. You can lightly sprinkle salt over them if you want to. While the sauce is simmering, heat your cast iron skillet on the stove. 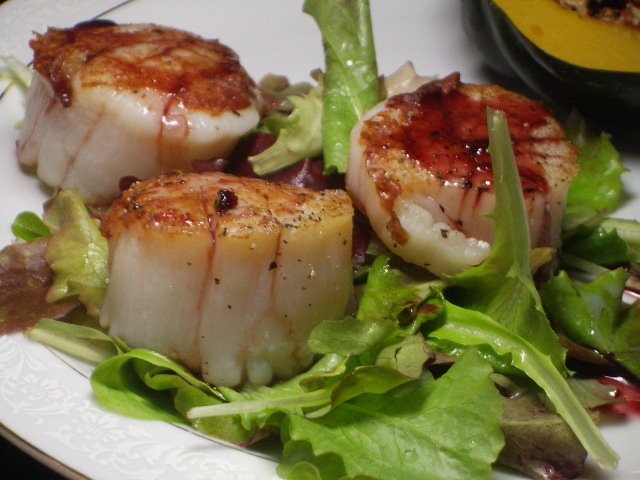 Throw the scallops on and sear for about 2-3 minutes on each side depending on the size of your scallops. Make sure your skillet is hot enough so that a good brown crust forms. Serve over mesclun greens and top with the pomegranate sauce. ENJOY! *Note: Even what may seem like a small dash of red pepper flakes can make this sauce pretty spicy. Maybe its the heat, maybe its the vinegar… whatever it is, if you don’t like really spicy things, go real easy on your red pepper flakes. On the other hand, the spice is a nice balance to the sweetness of the fruit.